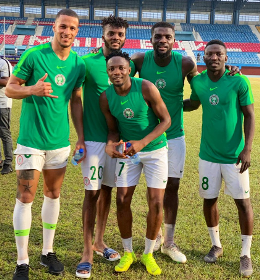 If John Ogu has his way, he would like to see the Super Eagles play their international matches at the Stephen Keshi Stadium in Asaba, and his statement will surely baffle several fans who have complained about the playing surface. Speaking post-match after Nigeria's 3-1 win vs Seychelles, captain Ahmed Musa admitted that they had a tough game because the pitch was not too good compared with the pitches they use at their clubs. The poor state of the Stephen Keshi Stadium pitch was very clear during the game and the likes of Alex Iwobi and Paul Onuachu struggled as the conditions made the ball bounce awkwardly. Allnigeriasoccer.com understands that the Super Eagles taking Asaba as their home for recent games is a political move by the Nigerian Federation supremo Amaju Pinnick, who has close links with Delta State Governor Ifeanyi Okowa. 'Yes, to be honest they gave us a good hotel to stay, they gave us good security,'' said John Ogu post-match. Super Eagles fans have called on the Nigerian Federation to take the national team back to Uyo for their subsequent internationals.